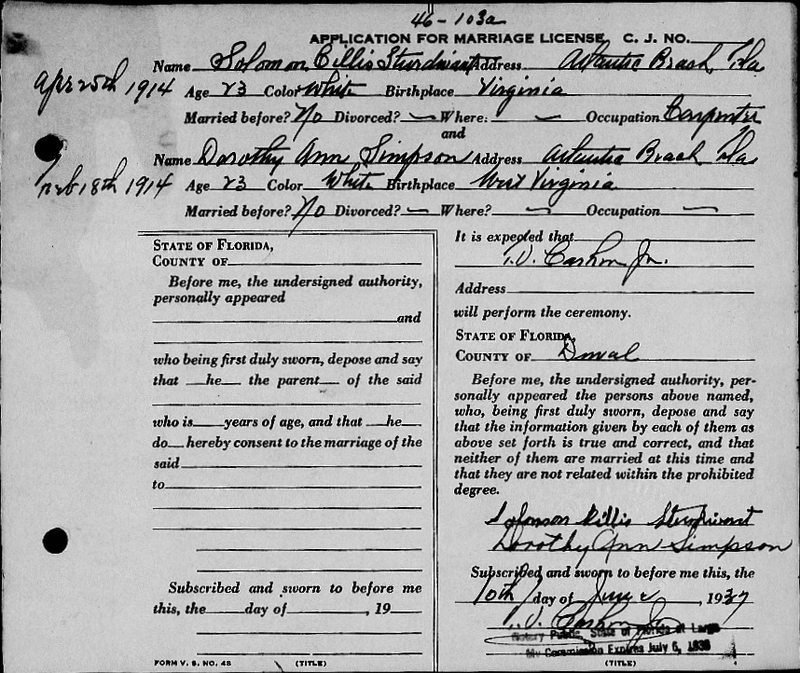 An application for a marriage license for Solomon Callis Sturdivant (1915-1945) and Dorothy Ann Simpson. Sturdivant was born to James Sturdivant and Mary Sturdivant on April 25, 1914, in Wytheville, Virginia. Private first class Sturdivant was drafted by the U.S. Army on December 29, 1942, while he was residing in Atlantic Beach. During World War II, he served as a member of the 231st American Antiaircraft Artillery Searchlight Battalion. PFC Sturdivant was Killed in Action (KIA) in France on March 5, 1945. He is buried at Epinal American Cemetery and Memorial in Dinozé, France. Digital reproduction of original handwritten application, June 10, 1937: Image Number 01183, Digital Folder Number 004706872, GS Film Number 2109281, State Archives of Florida, Tallahassee, Florida. Image Number 01183, Digital Folder Number 004706872, GS Film Number 2109281, State Archives of Florida, Tallahassee, Florida. 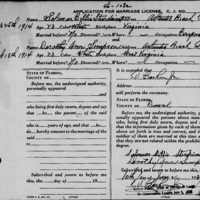 “Application for Marriage License for Solomon Callis Sturdivant and Dorothy Ann Simpson.” RICHES of Central Florida accessed April 21, 2019, https://richesmi.cah.ucf.edu/omeka/items/show/9322.